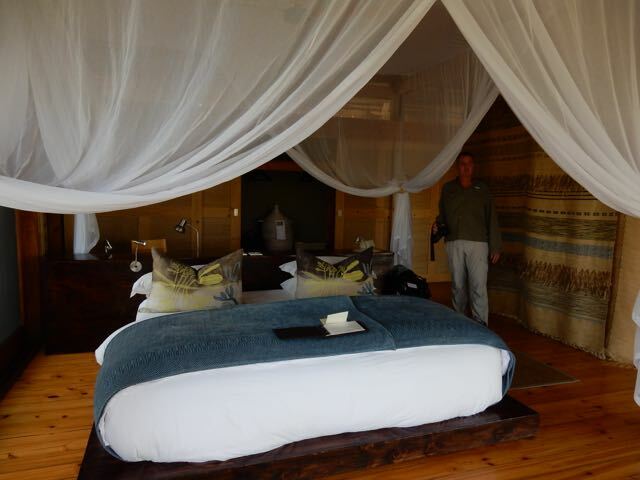 After three incredible days at Duma Tau filled with rampaging elephants, dancing storks, stunning leopards, and hungry lions could it get any better? 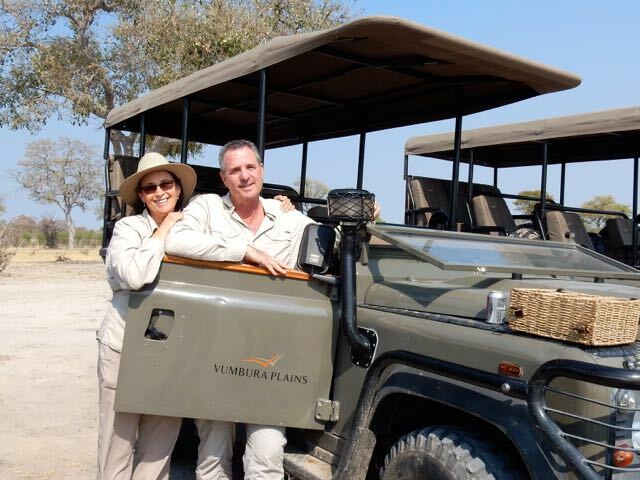 Our next stop was Varumba Plains. 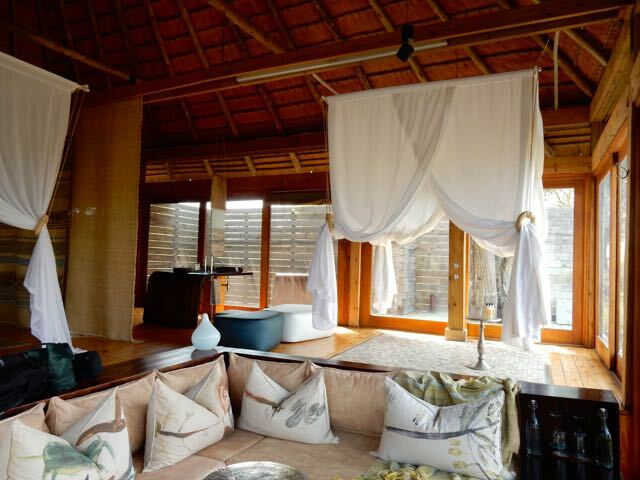 We didn’t have far to fly as the safari camps of Xigera, Duma Tau and Varumba Plains were all situated in the Okavango Delta. 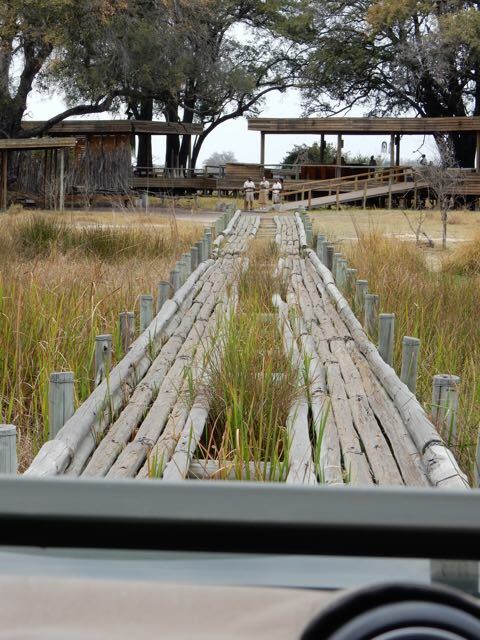 We hadn’t seen any Wild Dogs yet, so they were still on our list. We landed at Varumba Plains dirt runway where three jeeps picked us up. The luggage was loaded onto a fourth. Our bags would be waiting for us by the time we got to the room. All three camps were completely different. Xigera was all about water. Many of our animal drives were done in boats. Duma Tau had plenty of water, but the roads were mostly dry. Varumba Plains was the opposite. 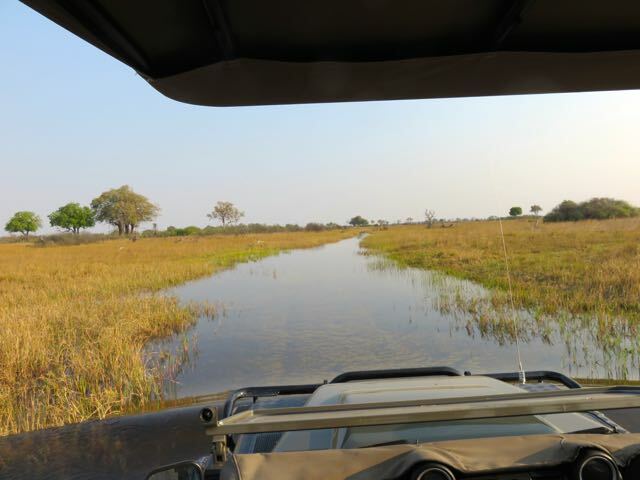 Some of the roads we traversed were more like rivers, and not necessarily shallow rivers. A bridge we had to cross on the way to camp. Our inside sitting room with the indoor shower just behind the couch, and the outdoor shower just past the sliding glass doors. 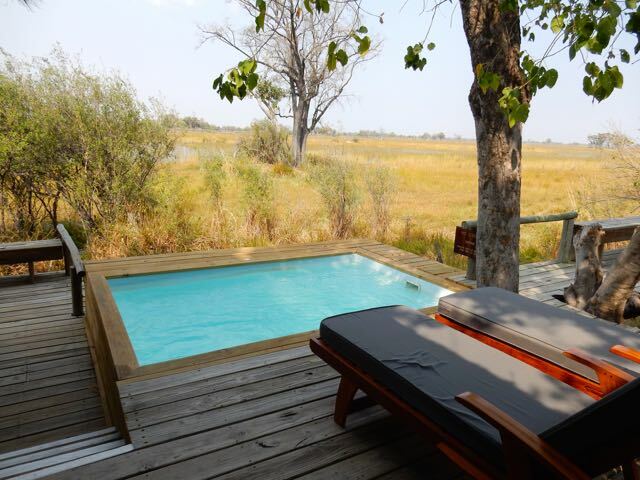 Our own private pool with a view. As we were driving from the airport to the lodge we came to a water crossing that looked so deep I thought they were going to ask us to swim. Fortunately they didn’t. 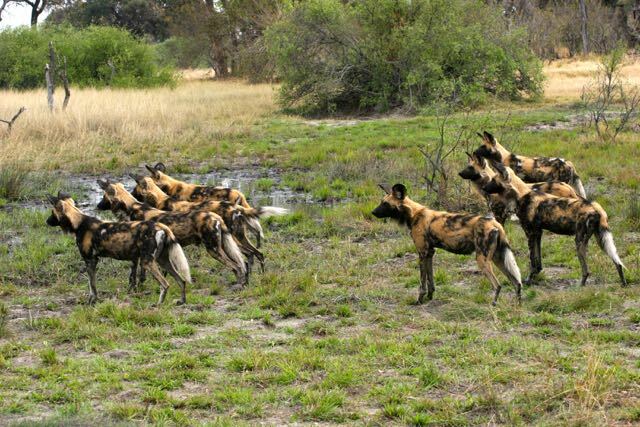 There was a pack of Wild Dogs on one side of the crossing checking out a Crocodile on the other side. It was just a baby croc, but I could not believe how skittish the dogs were. They were obviously thirsty, but only a few got up the nerve to go all the way down to the water’s edge and drink. 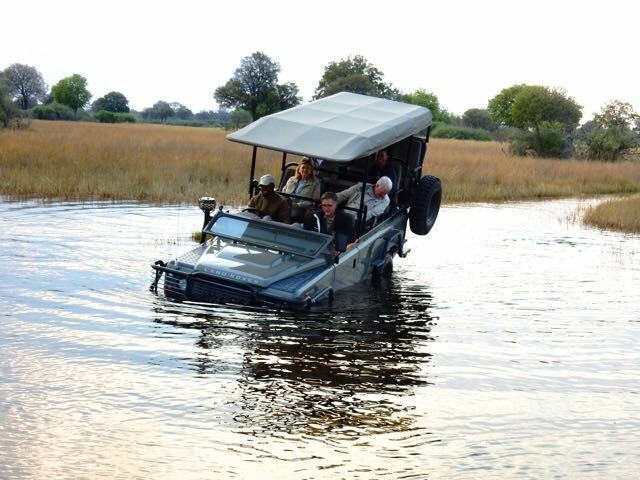 I suppose they were more worried about the big mamma croc that they couldn’t see lurking in the water. Some very cautious wild dogs. 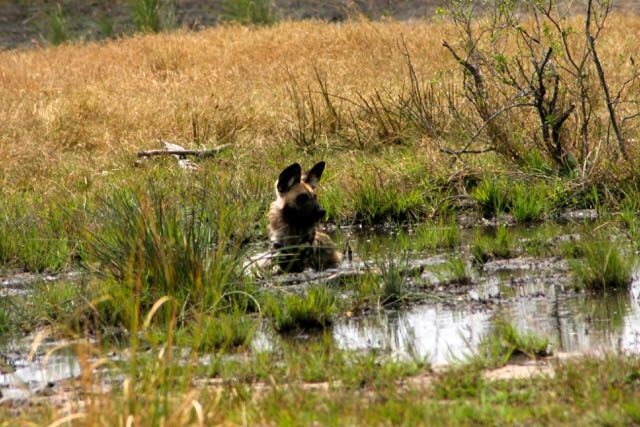 One Wild Dog decided to take a bath. You’ve got to be kidding. Is that a road? On the first animal drive our guide spotted a cloud of dust in the distance. He said that was the sign of a large herd of Cape Buffalo. 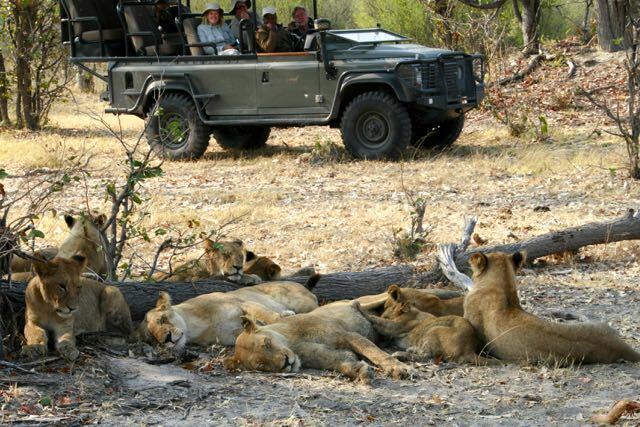 As we were coming up on the herd of over 1,000 animals we spotted a pride of thirteen lions. 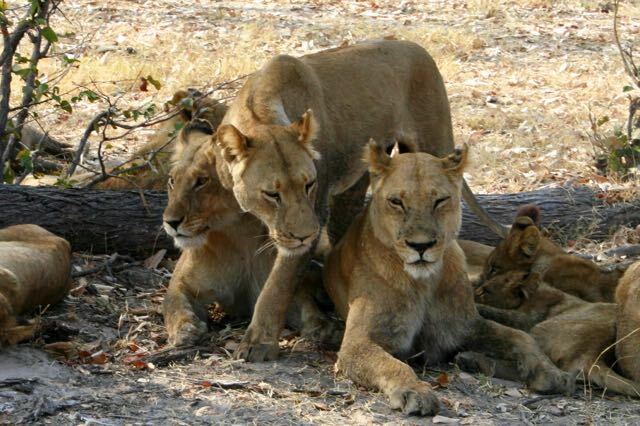 Of course a number of lions were just cubs. So far as the buffalo were concerned they didn’t count. The buffalo knew the lions were there, and the animals at the back of the herd were very skittish. A large male buffalo stayed back to keep a constant eye on the predators. 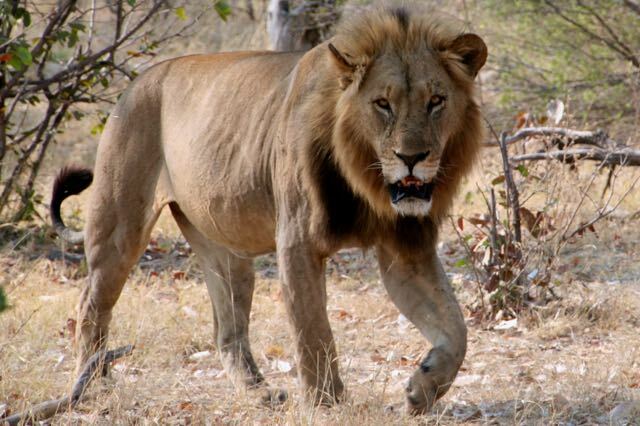 The lions were very cautious, and didn’t want to mess with the big fellow. They were looking for something a little easier like a very young animal or an old sick animal. You have to love these ladies. We actually saw the lions go after a buffalo, but the big male jumped in and chased them away. A traveling mate in another jeep got a picture of one of the lions on the back of a Cape Buffalo. 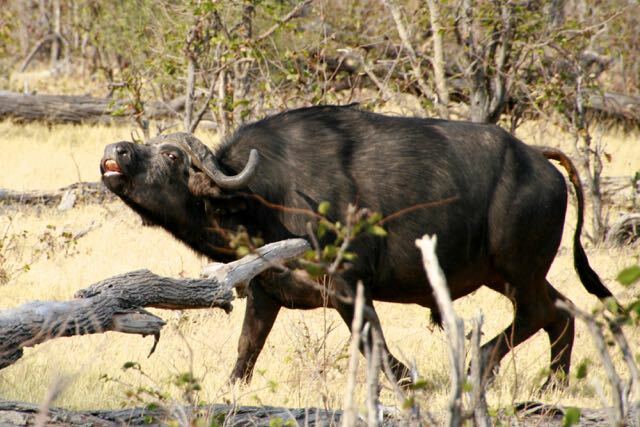 A pissed off Cape Buffalo. 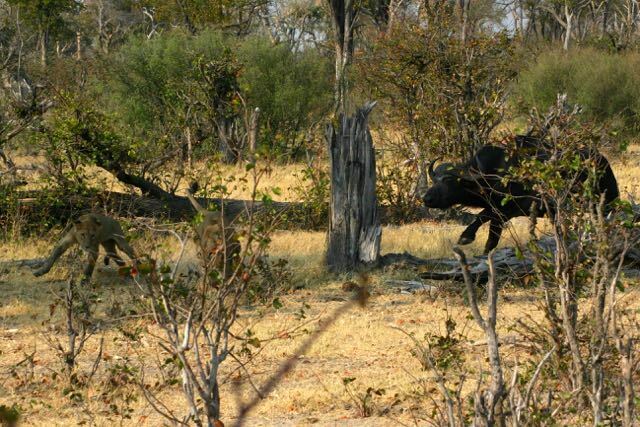 Two lions being chased off by a Cape Buffalo. 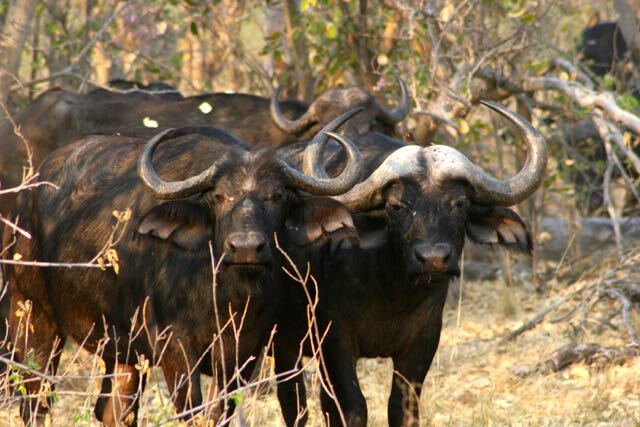 A male and female Cape Buffalo. The male is on the right. The animals basically ignored our jeeps. 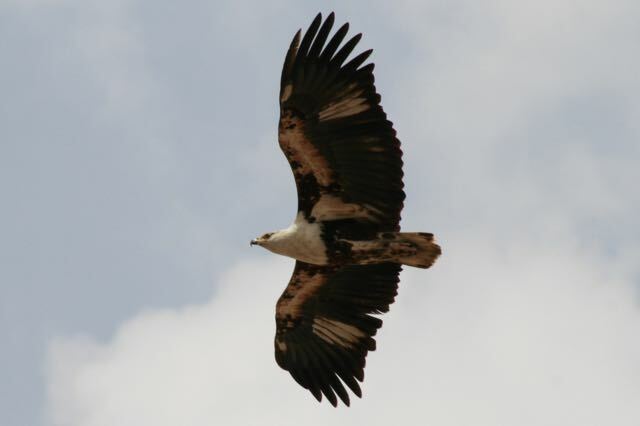 A Fish Eagle taken by Lisa. 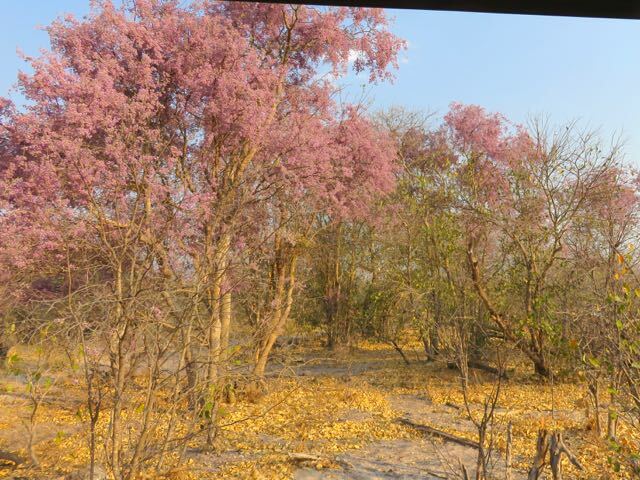 Beautiful trees that were everywhere in the Kalahari Desert. 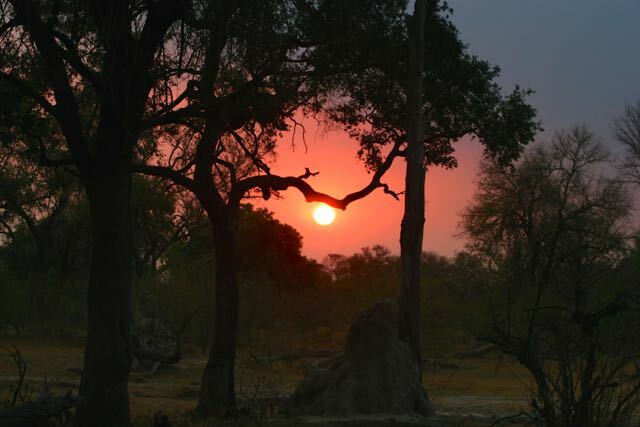 Sun rise over the Okavango Delta. 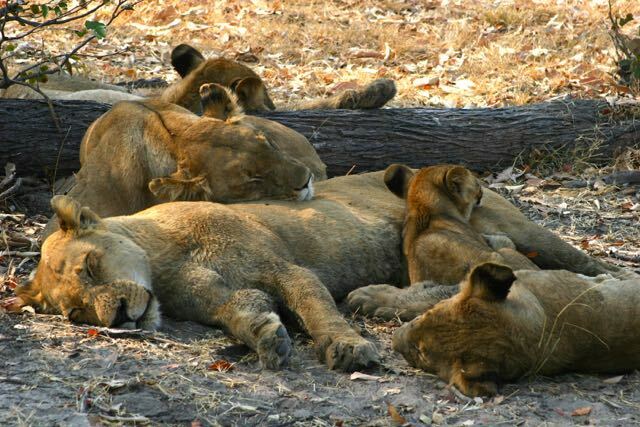 The lions didn’t seem to be all that intent on making a kill. Our guide said that when it gets dark they prefer to hunt. 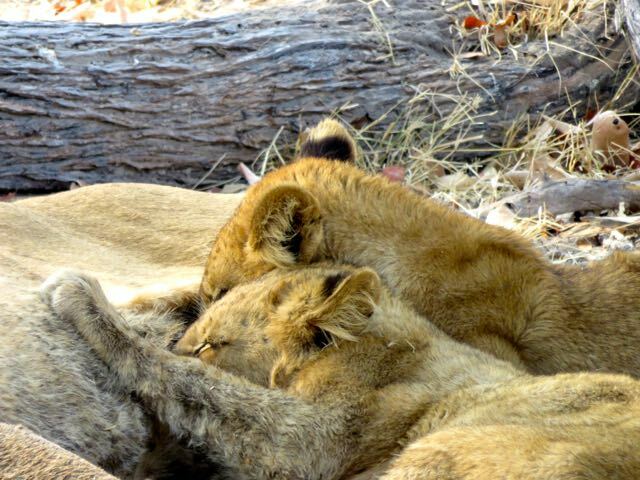 I had no idea how affectionate lions were. I’ve never been a cat person, but watching these lions could change my mind. They obviously enjoyed each other’s company, and acted as if they were just one big happy family. Of course the big males stayed back, and apart from the rest of the pride.